Tree First Aid: After the storm! 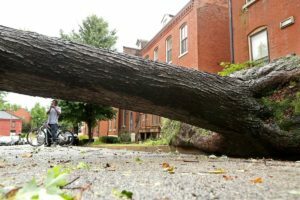 In the aftermath of a major storm, the initial impulse of property owners is generally along the lines of “let’s get this mess cleaned up.” But hasty decisions can often result in removing trees that could have been saved. Take safety precautions. Look up and look down. Be on the alert for downed power lines and dangerous hanging branches that look like they’re ready to fall. Stay away from any downed utility lines, low-voltage telephone, or cable lines and even fence wires can become electrically charged when there are fallen or broken electrical lines nearby. Don’t get under broken limbs that are hanging or caught in other branches overhead. And, unless you really know how to use one, leave chainsaw work to the professionals. Remove any broken branches still attached to the tree. Removing the jagged remains of smaller sized broken limbs is one common repair that property owners can make after a storm. If done properly, it will minimize the risk of decay agents entering the wound. Smaller branches should be pruned at the point where they join larger ones. Large branches that are broken should be cut back to the trunk or a main limb by an arborist. For smaller branches, follow the pruning guidelines shown in the illustration so that you make clean cuts in the right places, helping the tree to recover faster. Resist the urge to overprune and don’t top your trees! Don’t worry if the tree’s appearance isn’t perfect. With branches gone, your trees may look unbalanced or naked. You’ll be surprised at how fast they will heal, grow new foliage, and return to their natural beauty. Untrained individuals may urge you to cut back all of the branches, on the mistaken assumption that reducing the length of branches will help avoid breakage in future storms. While storm damage may not always allow for ideal pruning cuts, professional arborists say that “topping,” cutting main branches back to stubs, is one of the worst things you can do for your trees. Stubs will tend to grow back a lot of weakly-attached branches that are even more likely to break when a storm strikes. Also, the tree will need all its resources to recover from the stress of storm damage. Topping the tree will reduce the amount of foliage, on which the tree depends for the food and nourishment needed for regrowth. 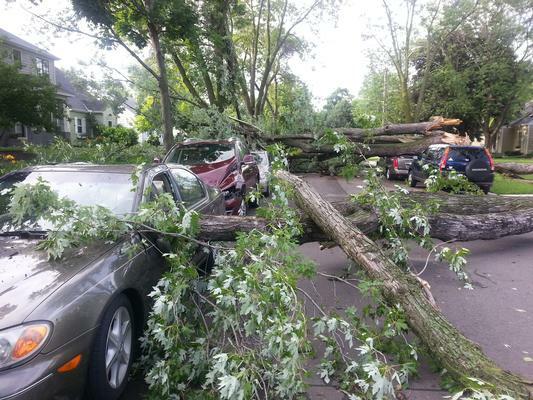 A topped tree that has already sustained major storm damage is more likely to die than repair itself.